Let me begin by saying, The Fifth Petal by Brunonia Barry, is not a book for everyone. It is not a book that I would say is a “must read.” However, for the right audience, this book is a fun read. That right audience? People like me who are into all things Salem, witchcraft, and murder mysteries. 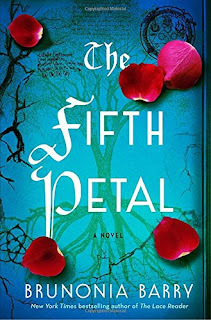 The Fifth Petal is a fictional novel set in Salem that involves a decades old unsolved murder of three goddesses who were obsessed with their familial connections to their Salem witchcraft trial ancestors. The horrific murders left their mother-like figure broken – mentally and emotionally. After ending up in and out of mental hospitals, Rose is accused in present day of a Halloween death. The lone child survivor of the previous Halloween massacre, Callie, comes back in town when she learns of Rose’s fate. Her journey back to this town where her life was forever changed is not easy. She struggles to connect her past with her present. Along the way, there are modern day witches, love interests, and petty town rivalries. Ultimately, I enjoyed reading it – especially in October. The suspense kept me wanting to find out what really happened. I do like when things get a little trippy and the supernatural mixes in with real life. However, the ending seemed to fall apart a little for me. There was a lot of crazy going on. But, even with a ending that left me less than satisfied, I enjoyed the book. It was a nice escape from reality. So, if that is what you are looking for right now, check it out. I received this book from Blogging For Books in exchange for an honest review. You can purchase the book from Amazon here or by clicking the image. *This is an affiliate link. Thank you for supporting my blog!